Are you connecting? Are you meeting people? Are you getting more traffic to your blog from being listed/participating here? Do you have any ideas on how to improve the site? What would you find a valuable service/column? Would you like to contribute on a one time or recurring basis? One column that I would like to add is an "Upcoming Alabama Events" column - please let me know if you'd be interested in writing it! Also - the meet-ups we've been having in Birmingham have been a huge success, a lot of fun, and people have been eager to meet up again. I would really like to expand this so that we have meet-ups in other areas of the state. I've been thinking that what might help that process and help new members to get connected is to have Area Ambassadors. An Area Ambassador would organize periodic meet-ups (which simply just means picking a place and time and committing to being there, and I will publicize/blog/tweet about it), and also would visit new Alabama Blogger members' blogs in their area to welcome them and help them get connected. Does that sound like a decent idea? Would any of you be interested in being an Alabama Blogger Ambassador for your area? I would be sure to list your name and blog on the sidebar. So - give me some feedback!! Let me know what you like, what you don't like, and your suggestions for making this site better! Also let me know if there are any ways that you would like to get more involved here at Alabama Bloggers! Hello there all of you art lovers. My name is c.a. Marks and I will be writing the bi-weekly column of all things art related. Now, me personally, I can't draw a straight line to save my life but I sure do love art and all that it represents, in all forms. We are privileged enough to live in a state full of art supported endeavors. Let me highlight one such beast that is located right here in my hometown of Huntsville, Alabama. The Lowe Mill Arts & Entertainment as well as Flying Monkey Arts. ...located in historic Lowe Mill, an old textile mill built in the year 1900. Lowe Mill ARTS & Entertainment supports a diverse community of artisans and businesses that are dedicated to the free expression of the arts in Huntsville. The vision for Lowe Mill is of a true arts destination, where a community of artisans can practice their trade while improving their skills through interactions with other artists, all the while educating the public about art and its value. Lowe Mill is home to a variety of different groups and artists, including The Flying Monkey Arts Center, Everett Cox’s new foundry, Susan Knecht’s glass blowing studio, Happy Tummy Restaurant and 34 new artists located on the recently opened 3rd floor. There are over 50 artist studios on site throughout the Lowe Mill building. You can read more about Lowe Mill Arts & Entertainment on their ABOUT PAGE. Now, for the longest time I used to think that the Flying Monkey Arts and Lowe Mill A&E was the same thing but they are not. Lowe Mill is the whole entire complex that houses the artists and Flying Monkey is a non-profit that is within (or housed if you will) in the Lowe Mill A&E facility. The Flying Monkey Arts Center includes a variety of participating artisans and groups such as The Film Co-op, Vertical House Records, and the Crash Boom Bang Theatre. If you are looking for a grass roots art movement then The Flying Monkey Arts Center is for you. They put a whole new spin on the term Bohemian. It is my opinion that every town should have an art co-op such as The Lowe Mill Arts & Entertainment and Flying Monkey Arts Center. These centers benefit our communities in many ways and we should support them anyway possible. Some may only need volunteers to help out and some may have wish lists in which you can contribute. Getting involved in a local arts community is rewarding. As I stated earlier I don't have an artistic bone inside of myself but that doesn't mean I am not creative. I love anything artisan related, I love being around it, so I get my own sort of reward by pitching in when and where I can; even if it's just writing about it and promoting the endeavor of another. Future article topics will include individual artisans and their personal stories, art retreats, art festivals, galleries, and all art mediums. Welcome to the Historic Town Of Mentone Alabama! Mentone is in DeKalb County it is located 35 miles from Chattanooga, TN. 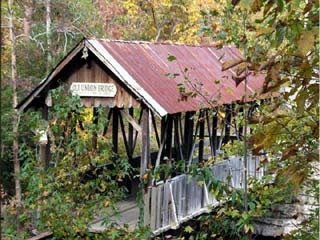 It is approximately 111.5 miles from Birmingham, but well worth the drive! This little town with a population of just over 500 offers activities for the entire family. The town of Mentone first came into existence sometimes in the 1880’s. It was part of the Cherokee nation and is believed that Sequoyah lived in the valley below during the time he developed the Cherokee alphabet. You can find a detail history here. It is very interesting reading. It is also the only place in the state of Alabama where you can ski!! Yes ski! For family fun you will need to check out Cloudmont Ski and Golf Resort. They offer horse back riding, golfing, hiking and of course skiing! They offer ski and chalet packages too. This is also summer camp head quarters. 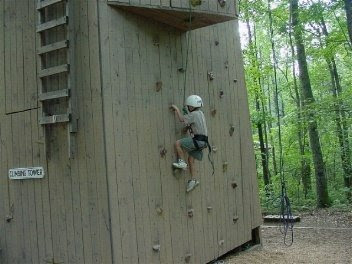 There are various camps: Lookout Mountain Camp for boys, Alpine Camp for boys, Camp Desoto for girls, Camp Laney for boys, Camp Skyline Ranch for girls and several others. The activities that these camps offer range from horseback riding, swimming, rock climbing, boating, fishing, archery, hiking, bike riding, craft making and there are tons more. Children also get to experience camp life and make life long friends. The scenery alone in Mentone is just breathtaking. Here’s a little example. When it’s time to eat you will definitely have to visit Big Jim's, Cragsmere Manna Restaurant, Dessie's Kountry Chef, Log Cabin Restaurant & Deli and Windwood Farms Restaurant - southern food at it’s best! 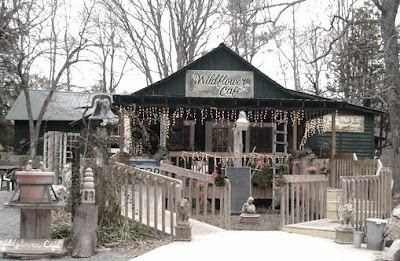 For your shopping pleasures you will enjoy White Elephant Antiques, Wildflower Cafe and Country Store along with arts and crafts shops. The Bed & Breakfasts in Mentone are just beautiful. 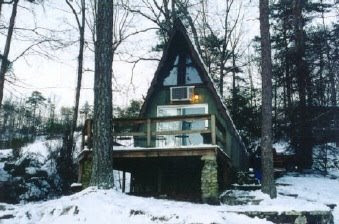 You have your choice of Raven Haven, Crystal Lake Lodge, Mentone Springs Hotel and so many more. Pictured below is Mentone Springs Hotel it is the oldest hotel in Alabama! Mentone hosts several events during the year. Fall Colorfest - Held the 3rd weekend of October each year in Mentone's Brow Park. Mountain Musical Strings every third Saturday on the town square May- December and Rhododendron Festival - held in the spring. In December they celebrate by having a Musical Mountain Christmas with a parade and of course Santa! One place that you will really want to see is Howard’s Chapel. This chapel was built around a huge rock. In the first picture you can see the rock to the right. I liked this picture of the inside. The builder was Colonel Milford Howard. 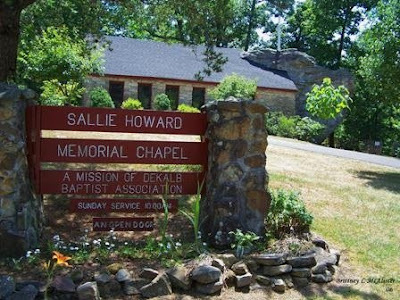 Services are held every Sunday and it is also popular for weddings. While you are in the area you can visit the group Alabama’s Fan club and Museum, DeSoto State Park and let’s not forget Little River Canyon National Preserve. I have been to all three and they are all worth the visit. There are a couple of web sites that might interest you. They are Mentone, Alabama and Welcome to Mentone Alabama both of these are great web sites that really go into detail about Mentone and it’s history. They also have beautiful pictures of the area. With all of this beauty and activities to do I can understand why Mentone is called "one of the best kept secrets in the southeast"! Hey everyone! I wanted to let you all know about a Social Media Meet-Up THIS WEEK, and also announce the date of our next Alabama Bloggers Meet-Up. Secondly, our next Alabama Bloggers Meet-up will be on Friday, August 7th at Zoës at Patton Creek (Birmingham) at 11am, UNLESS I get an overwhelming response that 11am is too early to meet, in which case I will post a retraction and time change at a later time. So, RSVP at the eventbrite site if you are going Thursday night, and RSVP on this post if you are planning on coming on 8/7. We've had an AWESOME time at our other meet-ups, so we'd love to have you!! Live From the 205 is a great stop on your travels in the intertubes. Kim claims she's "crazy in Alabama" and you hope "nuts" is relative since so many of her posts seem quite easy to relate to. She grew up in Singapore, loves Craig Ferguson and stalks her local weatherman. No specific niche for this blog other than "Kimtastic." And with that comes the journey most of us wouldn't trade with Kim for anything. She lost her husband to an accident less than five months ago. Reading her blog from then until now is a fascinating glimpse into the world of grief. Both hating it, embracing it, and moving past it. She weaves in out of these phases like a car in traffic simply trying to arrive at some unknown destination. But know this. You won't click out of her blog pitying a "widow" too young for the title. You will leave impressed with her humor and endurance while facing one of life's unexpected tragedies. Getting the right idea for your blog is sometimes just under your nose. There are ideas for articles and posts every where you turn but ideas can be sneaky. It is important to learn to recognize great ideas and to get them down on paper or the computer before they get away. 1. Use the waiting room as your personal resource. Each magazine will have dozens of stories that can give you ideas for great articles. 2. Break down the sermon each week. You may get one post, you may get a series of posts or you may end up with something completely unrelated to the actual sermon. 3. Watch the news. As long as a pop icon hasn’t died there are often a dozen interesting stories that can spark your inspiration. 4. Ease drop on others at the restaurant, in the elevator or any where you can get away with it. 5. Go to the park. Kids are always a great inspiration for articles. 6. Go through your pictures. Write an article around your images. 7. Review a movie or book. Try not to give away the essence of the movie but do let the reader know what you thought of the movie. 8. Visit other blogs to see what people are reading. 9. Let the rhythm move your soul. Turn on some tunes or just use your favorite lyrics to guide your posts. Do a series with your favorite song titles as the title of each post. 10. Do a top ten list. Lists are always fun. There are no restrictions on where you can uncover inspiration. The key is to get that inspiration on paper. Carry a notebook, a recorder or some way to lock down your inspiration before it gets away. For more tips to help you find your inspiration for your blog visit Successful Freelance Writer. I'm about to fly to Chicago for Blogher '09, one of the biggest blogging conferences for women! I'm excited, scared, panicked, nervous, and intimidated - all at once! 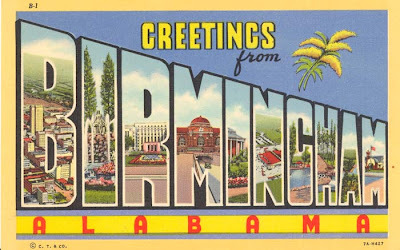 However, I didn't want to miss the opportunity for all of us Alabama attendees to connect, so if you're going to Blogher this weekend, linky in below! Maybe we'll run into each other, and at least have some connection with someone else at the conference! I'll be looking for you!! Artist Christine Linson had lived in Cleveland, Ohio her entire life. It was there she had raised her family and was a successful art consultant. She promoted artist in the Ohio area and worked with high profile clients and corporations in assisting them in purchasing art. For 15 years, Christine made her living in the arts industry. After her children were grown, her son, Dan became engaged to a young lady from Fairhope, Alabama. Christine became familiar with the area by attending parties for the engagement. Christine fell in love with the area. "The man I was seeing at the time was planning to retire in the south. In 1988 I moved down to Fairhope and started my own gallery. "Christine built her business alone for two years. Then her boyfriend was able to join her in his retirement. They married and together have worked together at the gallery. "Bob helps me have the creative time I need". Christine and Bob have extended their family with the addition of adopting two cats, Toulouse Lautrec and Matisse. 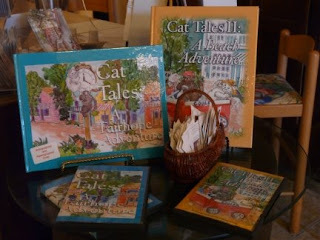 Her cats inspired her to write two children's books, "Cat Tales;A Fairhope Adventure" and "Cat Tales; A Beach Adventure". "I wrote these stories to include real people and real local flavor, they include 18 Fairhope Paintings". At the Christine Linson Gallery you will find fine art and hand crafted accessories. The gallery serves as Christine's art studio for all paintings in progress from large water color to figurative works., charcoal drawings and oil paintings. 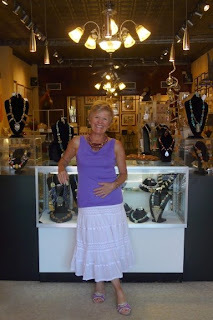 Christine is well known in the area for the creation of many Fairhope and local area/Eastern Shore water colors scenes. She also has ornaments, puzzles and note cards with her painted designs. 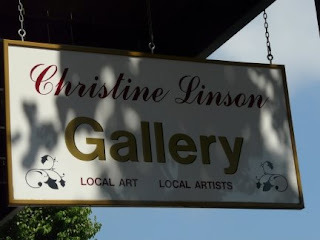 You can find Christine's Gallery located directly across from the landmark clock on Fairhope Ave. Stop in at the gallery for art talk, small talk and pleasant conversation with Christine. Today’s tour takes us to Union Springs Alabama other wise known as the Serendipity Center of the South! 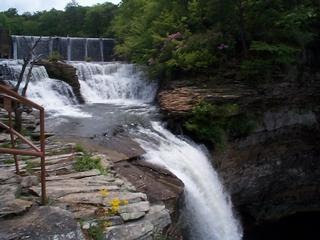 Located an hour from Montgomery it is indeed a small jewel in our wonderful state. Union Springs is the county seat of Bullock County. It was formed in 1832 when families started moving into the area after a bitter war between the White settlers and the Creek Indians. The building of two major railroads made it a busy commerce hub. Many residents became very wealthy due to this. Union Springs has 6 public schools and 1 private school. The public schools include 2 elementary schools, 1 middle school, a high school, automotive school and vocational school. The private school grades range from K4 – 12th grade. Built in 1843 the Bonus- Foster-Chapman house is one of the oldest homes in town. Moorish Revival style it is one of the finest surviving plantations in Alabama. This town is loaded with homes like this. There is even a ghost house. The Keller- Williams House is home to the towns most active ghost. It was built in 1903-1904 this beautiful Queen Anne home definitely has history! If you are a sportsman this is the place to be. There are several sportsman's clubs in the area. The Greenway Sportsman Club, Shenandoah Plantation and The Master Rack Lodge. 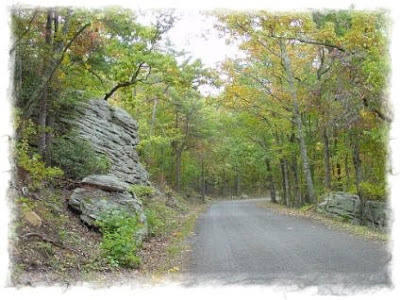 Deer, turkey, hog and fishing – a sportsman’s paradise. Annual events in Union Springs include the Veterans Day Celebration and the Bird Dog Field Trials. Union Springs hosts the largest in the country national Amateur Free-For-All Championship in February. Bird Dog Field Trials begin in October and last until March. It is a long tradition that started in the early 1900’s, owners and hunters from all=2 0around the world come to Union Springs for these trials. Another annual event is the Chunnenuggee Fair. First started in 1980 as a way to raise money for historic markers from the State of Alabama it has fast become a beloved event. Music, games, rides and fun! It is held the last day of April and continues to grow every year. There are just so many interesting things about this little town that I couldn’t possibly put it all here. Please click over to the Union Springs web site to see all of the wonderful events, historic buildings and history of this beautiful town. I hope you enjoyed this Hometown Tour of Union Springs. Amy's Extraordinary Alabama: Living in a Small Town. Life in a small town (technically ours is a city because of population, but we're still very much a small town) can be frustrating for some who move from a larger area. I've known many who have moved here and just couldn't handle it and moved away. For me, I'm fairly content with living here. Let's face it when you grow up in a small community, 13 miles from a small town, not even incorporated and not even a caution light, almost anything is a step up. I do occasionally need to get to a big city (whether for shopping or just my sanity who knows)and luckily there are a few just 1 - 2 hours away. I won't list all the reasons we like having a small town life, but I can assure you it's never dull. Sure news wise there might not be much going on, but if you pay attention there is a lot that makes life enjoyable. One of the aspects I love is the time between mid-July and August. We start school here a bit earlier than most districts. We start a week earlier so we can have a week off in the Fall. I'm all for it. I love having a Fall Break. Where was I? Oh yes. Why I love this time of year. The schools start sending out these important pieces of paper. The letters either let you know when to pick up your child's schedule or for the lower grades these greatly anticipated envelopes contain THE NAME. The name of your child's teacher. Make no mistake. The day those envelopes arrive it only takes a few seconds before the phone lines start jumping. Word spreads faster than wildfire in a small town. And if you happen to be a later delivery for your mail truck it's sheer torture. "Who is Mrs. S or Miss B?" There have been a couple of years that a very good friend of mine has been out of town and once she heard that the letters were out I've had to go get her mail or let myself into her house to open the letter to find THE NAME. Today was the day that parents received THE NAME for their younger children and I got the said call from a friend asking me about the teacher her child received whose name we did not recognize. This friend was on a trip with my aforementioned very good friend and when she got on the phone I knew what to ask. "You want me to go get your mail and open that letter don't you?" "You don't have to, but if you don't mind..." she replied. Of course I didn't mind because I knew she would do the very same for me. And in the midst of it all there was some detective work in finding out who the new teacher was. It didn't take long. Just long enough for 3 short phone conversations. And in 2 weeks it will all start again as the parents of the older elementary aged children receive their teacher assignments. Yes, life in a small town can be quite entertaining. You may have to look for it but it's there. Thanks for letting me share this funny aspect of my small town life. I'm sure I'll be sharing more humorous situations of small town life again soon. What about where you live? How does it differ in larger, more populated areas or even other small towns? I'm curious. The Start of Summer Giveaways are over, and it's time to announce the winners! Congratulations to all of you!! Be sure to leave your thanks here for our Start of Summer giveaway sponsors, Birmingham Menus and Turner Publishing. You can also tweet your thanks to Birmingham Menus! 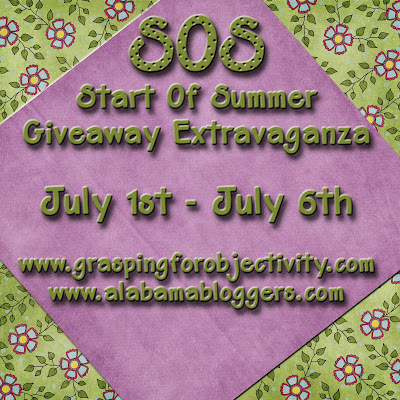 If you won, please go ahead and email me your address at rachel@alabamabloggers.com. I will try to get out emails to all of the winners, but it may take me a little while! If you didn't win here, be sure to check out the rest of the Start of Summer giveaway winners at Grasping for Objectivity in my Subjective Life! I stumbled upon Leigh's Tales from Bloggeritaville a few weeks ago by simply scanning The List and letting my ADD pick the destination. I chose wisely. Leigh is a self-described roller derby queen wannabe. She's also a mom, photographer and writer. You get a full and fun glimpse into the life of this frugal 30-something who can be found rambling about detailed day trips, restaurants she loves and doesn't love, and how to keep your wallet worthy of an early retirement. Her feature, Thrifty Thursdays, is perfect for those of us trying to live high on the hog, but not pay full-price for the pig. She even has a bonus blog at Plates and Places which provides more than 100 recipes of southern staples and other yummy recipes she's discovered on her travels. 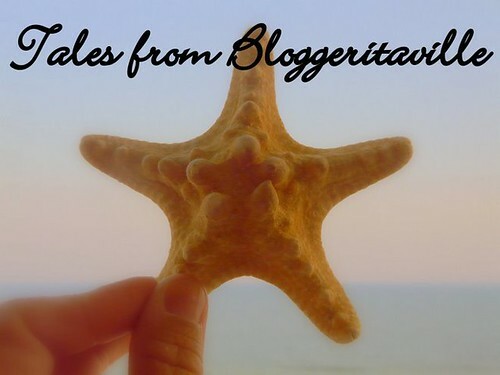 Finally, it's not a bad week to discover Tales from Bloggeritaville since it's her blog birthday. And the best part? Her readers are getting the gifts! Start with a plan. It doesn't matter what you are doing in life. A good plan is the best way to start. Success is guided by a plan that is followed with consistency and determination. Building a blog that does all that you want it to do starts with a plan. • Track your readers - you need to know exactly how many people are visiting and when so that you know what changes to make to increase your numbers. • Keep It Simple . 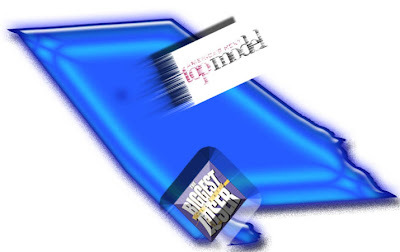 . . - set up an easy to find RSS feed button so that readers can continue to follow your blog. • Keep it clean - an easy font, limited widgets, fewer applications and add-ons and basic images will all make your blog easier for the reader to enjoy. • Make it you - every path to success is a unique path known only to you. Make your journey to your blog your own by writing what you want to write the way you want to write. Passion will do more to draw readers than anything else you have to offer. Building a better blog starts with a plan. Make a plan that includes a method for tracking visitors, a clean and simple design and content that is unique to your site. I sincerely hate honking. 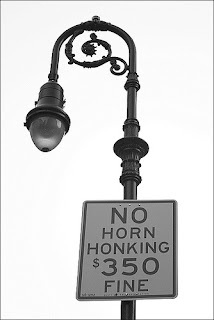 I refuse to do it, with one exception: if honking is necessary to stop someone from running into me. The only problem is that since that is the only time I use my horn, I usually can't even find it quickly enough to prevent a problem. THAT'S how rarely I honk. It's just a mega pet peeve. It just feels like an outpouring of temper. Anger. And I don't like anger. I ESPECIALLY don't like punitive honking - you know, when the event is already over, but a person honks anyway to show their aggravation. THAT is certainly unnecessary and rude. Traffic Light Honking (i.e. when the first person in line isn't looking and the light turns green) is okay, but only after waiting a LONG time, and then only a slight tap. I actually can't even stomach doing this. I usually wait until the light is turning yellow again, and then MAYBE I'll give them a small tweet of the horn. After all, I have been tending to a baby in the backseat and missed a light before - maybe that's what they are doing. When someone honks at me, it puts me in a sad, bad mood for a few minutes. I feel like I've just been chewed out by a complete stranger, usually for something that wasn't my fault (at least I like to think so). Ali and I went to the grocery store yesterday right at 5pm-grocery-store-rush-hour, and so the parking lot was crazy. I am especially cautious in parking lots due to my recent parking-lot "issues". As I was turning into the parking lot, someone in that row was pulling out of a parking space. I didn't want to risk going past them before they got out and on their way, so I waited for a minute and let them go first. I was well out of the road, but the person behind me didn't want to wait. He laid on his horn for a few seconds. I parked, and Mr. Rude Honker parked across the aisle from me. As I was getting Ali out of the car, I looked out of the corner of my eye to behold this rude person. I suppose it could have been perceived as a glare if one already had a guilty conscience about their rudity (I like the feel of rudity better than rudeness. It seems to more fully communicate the utter barbaric scurrilousness of honking). It was a very young guy in a snappy business suit. Younger than me. Seeing that I was looking at him, he yelled out to me, "Sorry, but you were just sitting there." I didn't really want to have a conversation with him, but felt that I needed to respond, so instead of saying, "Do you know how barbarically scurrilous you are?!?! ", I said: "Jesus loves you and so do I!". Ok, no I didn't say that either. I said: "Well I had to wait for someone to move out of the aisle before I could go." He must have been coming for just one item, because by the time Ali and I got into the store, he was already in line checking out. I tried to avert my gaze, but of course he was looking at me. I hate honking. If you're a honker, sorry. I don't hate you, I hate your actions. Originally published on November 8, 2008 at Grasping for Objectivity in my Subjective Life. Zoës Kitchen is by FAR one of the best restaurants in Alabama - I can honestly say that it is my absolute favorite! I eat there nearly every week - and sometimes twice a week!! I can admit it - I'm a Zoës addict. Chicken Kabob Dinner - includes 8 Chicken Kabobs, Rice Pilaf, Greek Salad, and Pita Bread. Baked Chicken Dinner - includes a whole Chicken, Rice Pilaf, Greek Salad, and Roasted Vegetables (Call 90 minutes ahead to ensure availability). Greek Chicken Marinara Dinner - includes 4 Chicken Breasts, Greek Salad, and Pita Bread. All of these meals are fantastic! 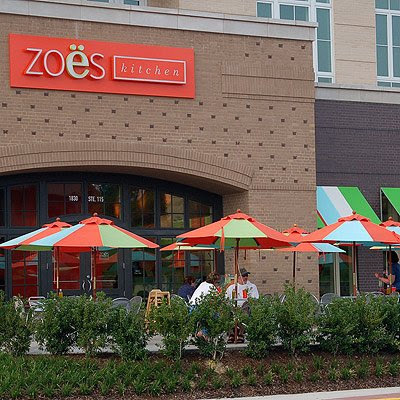 This gift card is good at any Zoës Location, which includes 5 locations in Birmingham, and one each in Tuscaloosa, Montgomery, Mobile, Atlanta, and several others out of state. So head on over to the giveaway post and be sure to enter!! Zoës is an AMAZING Alabama Restaurant!!! Historic Photos of University of Alabama Football Launch Party! Everyone was so charming to talk to and excited about the book! The setting of the ASHOF was a perfect venue for this event. And, of course, they had piles of Coca-Cola and Golden Flake products to go around, since you can't have Alabama Football without them! You can still enter to win copies of the books here and here - don't forget to enter!! So this past weekend there were auditions for two reality shows in Alabama. Two VERY DIFFERENT reality shows - The Biggest Loser (in Mobile) and America's Next Top Model (in Birmingham). One show where people learn to eat a whole lot less, and one show where people NEED to eat a whole lot more. I found the juxtaposition of the two auditions quite ironic - there wasn't a single soul in the whole state that would have qualified for both shows. Isn't that bizarre? And if I had to guess, I would say that the vast majority of us wouldn't qualify for either. Anyway, I was wondering if anyone went to the auditions to see the craziness, or auditioned for either show. We went to Brookwood Mall to experience the ambiance of the ANTM auditions, and of course I blogged about it. How about you? Any good audition stories/encounters/points of interest? Either link in a post about it or comment! 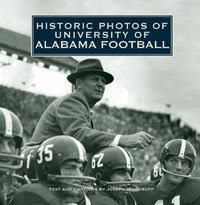 Don't forget about the launch party for Historic Photos of University of Alabama Football at the Alabama Sports Hall of Fame tomorrow (Tuesday) night at 5:30pm!! It is free and open to the public! And, if you come, it gets you an extra entry into the book giveaway contests - so be sure to let me know if you're there by commenting on the giveaway posts afterward!! As a follower and fan of Alabama Bloggers, there was no gnashing of teeth when Rachel asked me to start a column. And I may or may not be attracted to things called "Center Stage." 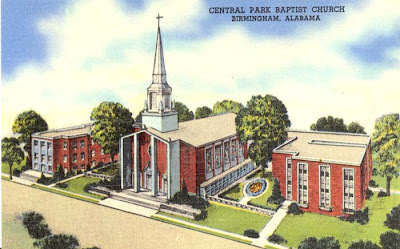 Each week, we will take a fanfare look at one of the many great blogs being churned out here in Alabama. With more than 150 bloggers already on TheList (make sure you're on it! ), I'm confident that my job as a blog stalker is secure. I started blogging July 2, 2008 as a way to share random moments with a best friend who moved 2,100 miles away. Here is my first post: "I am attempting to blog. I have usually avoided the commitment due to my pride of trying to be witty and eloquent. I have sacrificed those goals in order to capture some moments. Bear with me." Why is the blog called Jamie's Rabbits? My name is Jamie. I have this frustrating habit of “chasing rabbits” when I speak. This simply means I tend to get off topic and follow after another subject and then another always wondering how I started talking about gas station hot dogs. My blog tends to be a different "rabbit" every day. Who are you? Event planner, blogger, single, sister, daughter, aunt, fairy godmother, friend, teacher, small group leader, volunteer and consumer of shiny things. I hate ladybugs. I love God. Why should I read your blog? That's really your call. I find it's a nice break from things that make you stress out like jobs, children, driving, and lines at the supermarket. I do not actually condone surfing the web while driving. Do as I say, not as I do. So make your way to Jamie's Rabbits, for an entertaining blog with no real theme. Unless random is a theme. Is it? If you would like to have your blog featured on "Center Stage" then contact Jamie so she can swing by your neck of the internet woods. Please know she sometimes shows up uninvited, so you may see your blog on stage if she really digs it. There are as many reasons to blog as there are blogs on the internet today. Growing a successful blog means finding your niche and then developing around that niche. The best way to choose the direction of your blog is to find out where your passion lies and then pursue that passion. 1. What are you talents? Make a list of all those things that you are good at doing. Ask your family and friends to make a list as well. You may be surprised at all of the things that you have the ability to do. 2. What are your gifts? These are the things that really can’t be learned like making friends easily or being extremely giving. 3. What are your titles? You are looking for potential readers and you speak best to those that are in the same position as you are in. Do you work at home? You will be in a position to help other WAH individuals. Are you a mother? Your posts could be a breath of fresh air to other mothers. Write out a list of all your different titles. Put each list in order of those things that are most important to you. By looking at the talents, gifts and titles that you consider to be important you will begin to unlock your passion and discover the best niche for your blogging endeavor. We had a great time at our Second Alabama Bloggers Meet-Up today!! We had a total of 15 bloggers (if you include the four "pre-bloggers" in attendance). And, by the way, Wade and Valerie get the perfect attendance award, as they were the only other people (besides myself) that were also at the first meet-up. That could be a good thing (lots of different participants) or a bad thing (not many people are up for a redo) - but I'm banking on a good thing! If you were here, please link up below so that we can find each other's blogs! Feel free to link in your Twitter account also (if you refresh the page after linking, it will give you another link box). Also, if you blog about the meet-up, be sure to let me know so I can list it! Thanks for coming! We plan on meeting again on a Friday in August. If you have any ideas as to where to meet, let me know! Also, if you're not in the Birmingham area and would like to have a meet-up in your area, let me know and I'll promote it! Summer is here and for me summertime means fresh fruits and vegetables. I recently made a trip to Petals from the Past in Jemison, Alabama to the Black and Blue Berry Festival. I arrived early in an attempt to beat the crowds from getting the freshest, biggest berries, but when I saw the parking lot, I realized that there were others who had the same intentions as I. For $10.00, I purchased two one pint berry baskets (Quart baskets are available for $7.00) and went in hot pursuit to the fields for my bounty. The blueberry patch was first. There were rows upon rows of different species of blueberries. Petals from the Past does encourage pickers to sample the berries so that one can decide their favorite berry for picking. I decided upon the climax berries with their sugary sweetness and went to picking and sampling. It did not take long for me to fill my basket, being that I brought along some great helpers: my two youngest children and my niece, to help me pick. I decided that this was to be a memorable trip for them, like one of days past when families picked the fields together. After filling the blue berry basket, we moved onto the black berries, which were huge! The patches at Petals sure beat picking wild berries on the side of the road where you have briars, ticks, and snakes to contend with. At Petals, all you have to worry about is picking that perfect berry. And it really isn't a worry, because the berries are beautiful and plentiful. After our picking session ended, we purchased bottled cokes for the children, who were tired and hot, but admittedly had an enjoyable time. Inside the gift shop was a freezer of pre-picked berries, so I purchased some additional berries for baking. I highly recommend Petals; these berries are so wonderful in taste. I do not know if it is because they were handpicked but the berries at Petals are far more superior to what you can purchase in the supermarket. In the meantime, we are still enjoying blueberry muffins, blueberry cobbler, blueberry pancakes, blueberry buckle, blueberry cheesecake, blueberry smoothies and the list will continue to go on for months after picking season. A tip, if you do freeze your berries, do so by placing them on a baking sheet and putting them into the freezer. After the berries have frozen, transfer them to freezer bags and date the bags. This process will eliminate them from freezing in one big lump. Petals in the Past is open 9AM to 5PM Monday through Saturday. It opens at 1PM on Sundays. The farm is about a 30-minute drive from Birmingham. Take interstate 65 south to exit 219, exit right and turn right. Take the first left, the farm is one mile on the left. I hope you enjoy reading about today's Hometown Tour brought to you by Stevie. This was first posted on her blog on April 16, 2009. I hope you enjoy it as much as I have. I am inviting all my bloggy friends to take a tour of my hometown via postcard images. 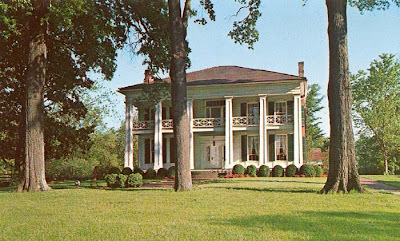 Birmingham, was established in 1871, but Arlington antebellum home was built in the 1840s by one of the future founders of the city. It is located in Old Elyton, the first county seat of the area. 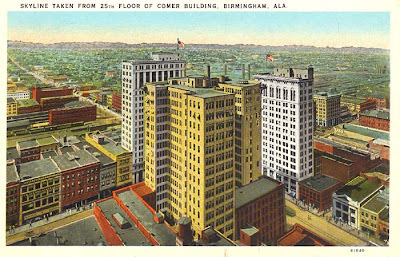 The city of Birmingham quickly grew and encompassed the home. Today it is located in the middle of a long established neighborhood. Every Christmas the home is decorated according to the style in it's hay day. Tea and cookies are served by costumed women and attendees are invited to tour the home. 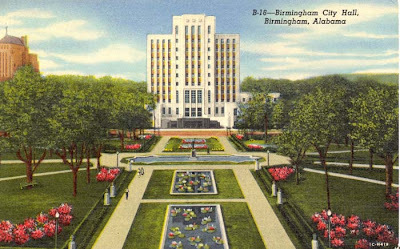 Birmingham's Byzantine inspired Beaux-Arts Terminal Station was the terminus for eight railway lines that came from and went to all sections of the United States. The station was built in 1909 and torn down in 1969 much to the continuing chagrin of historical preservationists. I vaguely remember going there. I mostly remember that it was huge and cavernous. In my mind's eye I see dust motes floating down from a high ceiling. I also remember going out onto the platform and seeing many different sets of tracks. I don't remember why we were there or when though. Too bad it's gone. The people who really remember say it was beautiful. 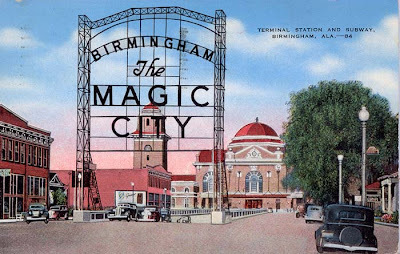 By the way, the city is nicknamed The Magic City because of the phenomenal pace of growth in its early years. If you look you can find a post or two with a couple of pictures taken in front of this municipal building last year when I had jury duty. The city is known for its steel industry. 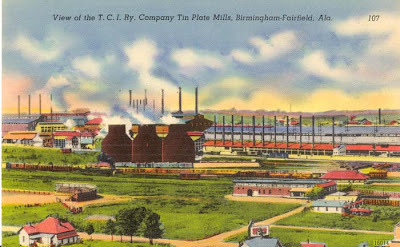 This next postcard is of T.C.I, Tennessee Coal and Iron Co. which later became U.S. Steel. This particular plant was close to my childhood home. In the years before the Clean Air Act it was not unusual for us to have to sweep coal dust from our front porch every morning. Many of my friend's fathers worked here. My own father retired from a cast iron company. My family belonged to this church from the time I turned six until I was in high school. Later my two oldest sons would attend private school here for three years. We lived close by and they walked or skated to school. My middle son still tells th e story of getting in trouble for skating through the church over to the school side one morning....only it wasn't him that did it. It was his older brother. For many years I was plagued by a recurring dream about the steps in front of the church. I always dreamed that I had tripped and fallen and couldn't get up (before the commercial "I've fallen and can't get up" days). Everyone on the way into church was always frozen in place and starring at me sprawled on the steps. 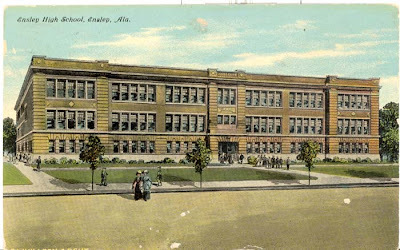 This is the high school I attended, as well as where my mother and father went. It was built in 1908 and closed in 2006. It was a three story building with a courtyard in the center. I spent some happy days inside its halls. I meet my ex husband there and received my high school diploma in the gym. I've written about this Chinese restaurant on the blog before as well. My family went here many times. My e x husband proposed to me here. 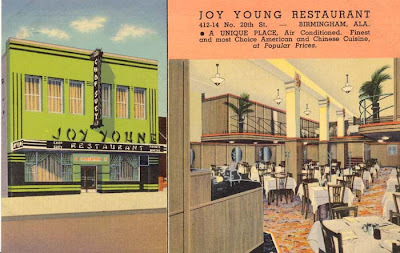 We took our oldest children here before Joy Young's closed its downtown location in the 70s. 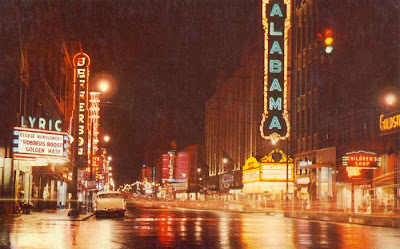 The Alabama theater is known as the Showplace of the South. My daddy worked here as an usher when he was a teenager. They wore white uniforms and gloves. It fell into disrepair and almost went the way of the Terminal Station, but forward thinking citizens banded together and began restoring the theater in the 80s. Today it is the venue for many theatrical performances and concerts. Old movies are shown here on a regular basis as well. Birmingham is the home to many beautiful churches. 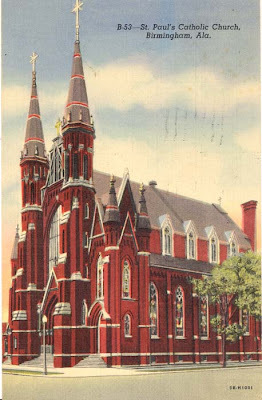 St. Paul's Catholic Church is located downtown. I love the twin spires. About 10 years ago a modern building went up a block away. The new structure sports twin spires as well which can clearly be seen from the expressway. Whenever I drive by I always strain my eyes to catch sight of those four spire s, the two modern and the two old ones. 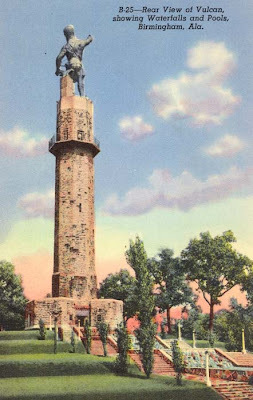 And lastly, no tour of my hometown would be complete without this sight....Vulcan, the world's largest cast iron statue. He stands atop Red Mountain and towers over the city from his perch above us all. In fact, hometown author Anne George made him famous by referring to him in her Southern Sisters mystery novels as the "moon over Homewood" since his naked backside faces the city of the same name. You might like to give her "Murder on a Bad Hair Day" or "Murder Boogies with Elvis" or "Murder Runs in the Family" a read sometime. Just don't believe everything she says about our hometown. Thanks for taking my vintage postcard hometown tour! That was a great tour Stevie, thanks so much! I hope everyone hops over to A Little Birdie Told Me So and check out Stevie’s blog.